It was a sad day for me last summer when my cousin, who is like a sister to me and a dear friend, moved to Austin with her two little ones. Her son is the same age as mine and they were the best of friends. She still has her lake house here and we’ve been lucky that she’s been back often. She is in town this week, in fact. She is great about sending me pictures, though. I put them on my fridge and in my scrapbook, pages I make for her. My cousin sent me this photo of her son and little girl by the fence in their yard and I knew immediately that it would be perfect for Echo Park Paper’s So Happy Together collection. This is another project I made with the August Album Kit at My Creative Scrapbook. I love these kits! This particular paper, the background, was a scene paper and I arranged my photo mat on the page to both cover up and incorporate the scene by echoing the flowers in the design. Actually, I flipped the background paper upside down because that worked best for my design, placing the heavy flower vine on the bottom left to anchor the page and leaving me a spot for a big title block. I think the kids look so sweet and innocent in the photo, just chilling with their sippy cups. The Echo Park sticker, “finding joy in watching you grow,” was just the right touch. Sigh. Babies grow too fast. 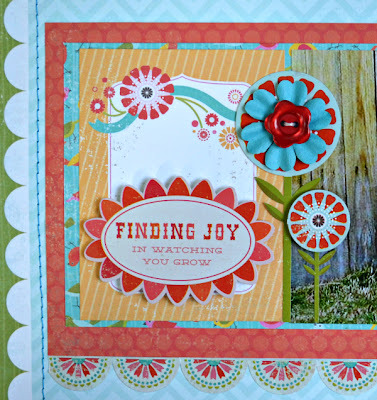 You added such great dimension by layering the flowers over the ones on the pre-printed pattern. Love your title work on here too. This is BEAUTIFUL Izzy!! I loveeeeeeeeeee that photo, the colors and loving the flowers!!!! That page is so colorful and happy. Love the photo and the design is beautiful. izzy, this is just sooo perfect! Love the colors on this and how you used the paper. I have trouble with those big prints instead of the all over ones :( kwim? What a fabulous LO! Super cute! Aw Izzy that is such a cute photo but what a shame she had to move away at least you see her regularly. Gorgeous page! And you were right about the papers. Love these colours! They work so well with the photo and sentiment behind the page. Both are very sweet. Gorgeous layout! That's too bad that your cousin moved. I'd always hoped that my child would have a close-age cousin nearby (it was not to be), so I'm glad you had that for at least a little while. This is so gorgeous Izzy! I love all the elements and that super little photo! The wood fence in that photo is really so great! Love the reds on the layout and is just so fresh and vibrant! Beautiful!